The brief was to design a set which could service both plays, allowing for a quick (one hour maximum) turnaround between them. The challenge set by designing two shows in one space is combining different themes into common images. The first play I approached was “Our Country’s Good”. Although I knew the play from having designed it before, I wanted a completely different approach, so I went back to the text to look closely at the themes and ideas written about by the author. I didn’t know “The Recruiting Officer” so well, but as I read this play themes integral to the two texts began to emerge. My idea behind both plays is the use of space. In “Our Country’s Good”, the convicts are stranded on an island of staging surrounded by semi-gloss floor. The officers are stranded with them and dramatic tension is set up as friction develops between the opposed groups. They are yet further removed from an Aboriginal backcloth, symbolic of the indigenous people of Australia represented within the play. The backcloth also has resonances of the shoreline of a strange country and the distance the characters are from home. Projected onto the backcloth are Aboriginal “Dreaming” symbols: the sun and the moon. These change and descend down the scarlet line on the cloth as the play progresses and end with a large red and “triumphant” sun setting on the convicts first performance of “The Recruiting Officer”. 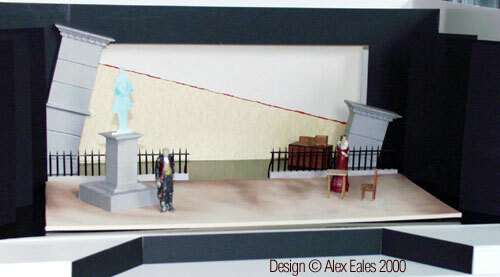 The set for “The Recruiting Officer” uses the same basic staging but emphasises different elements. The “island” of staging acts to confine the characters socially and by gender. Other scenic elements are railings, which emphasises social exclusion and are evocative of eighteenth century Shrewsbury, as are the two English baroque pilasters and the statue of the Duke of Marlborough. The Duke stands as an upright pillar of the community, a symbol of civic pride under whose gaze the bizarre events of the play take place. The diagonal of the backcloth becomes an off balance horizon line, a visual pun on the “justice” in the play. Projections onto this help to evoke Shrewsbury and its environs.